Veneers can come in two forms. They can be made of a composite resin material (direct veneers) or ultra-thin shells of ceramic (commonly known as porcelain). Among these two, the use of porcelain veneers has become very popular in the world of cosmetic dentistry. Since this kind of veneer provides faster and more convenient treatment to several minor teeth imperfections, it has been dubbed as “instant orthodontics”. Porcelain veneers, also known as dental veneers, are ceramic sheets, which are as thin as contact lenses. Veneers are bonded to the front surface of the teeth, for them to be properly aligned and straightened. Since these can cover the damaged part, they easily improve the overall appearance of your teeth. Their characteristics and colour give your teeth a pearly white kind of sheen. Porcelain Veneers create a natural-looking, radiant smile because of their whiteness and translucency. Considering that porcelain is non-porous, staining pigments can no longer enter into the teeth’s surface. This makes your precious teeth more resistant to discolouration. For getting porcelain veneers, two dental visits will be required. During your initial visit, you will undergo a comprehensive dental examination. The teeth will be prepared and accurate impressions taken. Results will be delivered to the dental lab, where the porcelain veneers are created for your specific needs. In your second visit, porcelain veneers are ready to be attached. 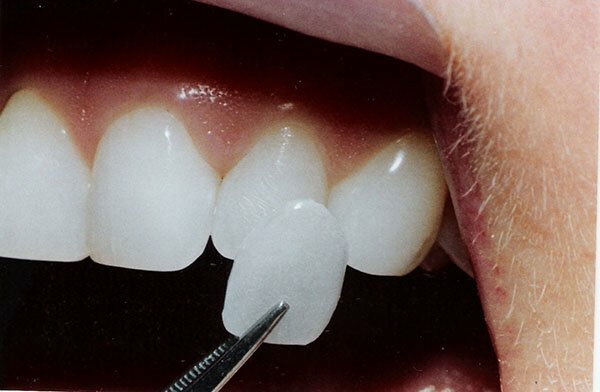 Using a dental cement to bond them, veneers are fine-tuned and then permanently connected to your teeth. Any final adjustments will be made for your porcelain veneer to ensure its strength and firmness to your teeth. Since the healing process won’t take any longer, you can immediately reveal your stunning smile in an instant. Veneers are capable of solving almost all of the cosmetic dental problems. The benefits it can bring to a person’s self-esteem are countless. Aside from promoting healthy-looking teeth, they also help in promoting exceptional oral wellness. For instance, damage on dental enamel may be caused by genetic predisposition, consumption of colas, tea or coffee, as well as certain medications, and smoking. Worn out enamel can be improved through the help of porcelain veneers. Wearing and tearing of teeth is unavoidable, especially when you age. This results to irregular appearance of your teeth, such as chips and cracks. Having porcelain veneers can also solve dental issues regarding uneven and unpleasant-looking teeth.